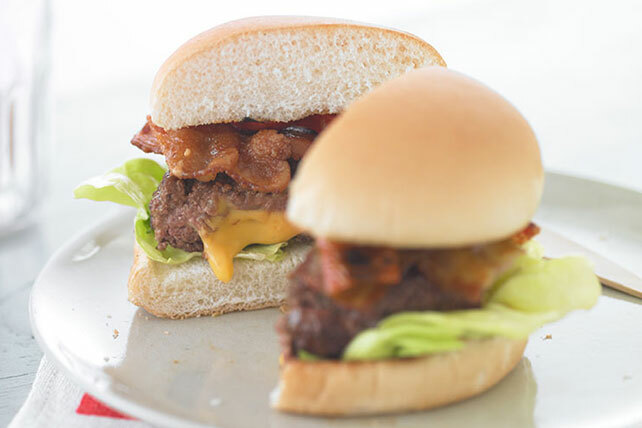 Make tasty burgers oozing with cheese using our Cheese-Stuffed Burgers with Bacon recipe! These cheese-stuffed burgers are no ordinary cheeseburgers. Mix meat and 2 Tbsp. steak sauce; shape into 8 (1/4-inch-thick) patties. Fold each Singles into quarters; place on 4 patties. Top with remaining patties; pinch edges together to seal. Grill patties 5 to 7 min. on each side or until done (160ºF), placing buns, cut-sides down, on grill grate the last 2 min. Fill buns with lettuce, burgers, remaining steak sauce and bacon. Serve with fresh fruit and baked chips to round out the meal. Cut 1 red pepper into 1/2-inch-wide strips; grill with patties 5 min. on each side or until crisp-tender and lightly charred. Add to sandwiches with bacon.